Redland businesses last night scored six of 12 awards presented at the 2013 Moreton Bay & Islands Tourism Awards. Redland City Mayor Karen Williams said the result was a ringing endorsement of the professionalism and vitality of Redlands tourism. “The winners should be commended for their strong commitment to excellence and for strengthening the Moreton Bay brand,’’ Cr Williams said. 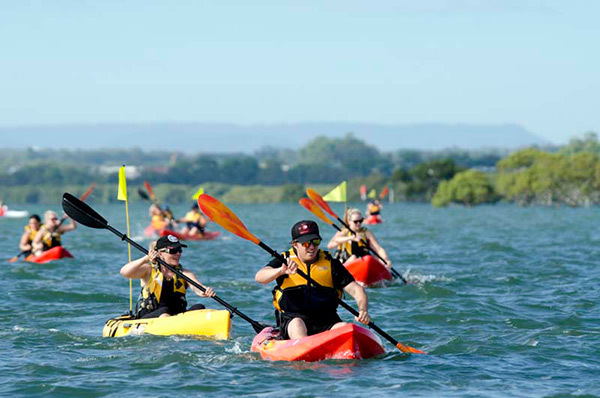 Redlands Kayak Tours was a big winner at the gala award night hosted by Redland City Council at the Redland Performing Arts Centre, taking out the Tourist Attraction and Adventure Tourism categories (the latter as a joint winner with Tangatours at Tangalooma Resort). The submission from Katrina and Tony Beutel’s water-based tours of Moreton Bay and its waterways was one of ten from Redlands operators. Council’s own Redlands IndigiScapes Centre backed up its win last year in the Eco Tourism Category to score the Excellence in Food Tourism award for its bush-themed cuisine in the Tea Garden Café. Redland Art Gallery won the Heritage, Cultural and Indigenous Tourism category for its contribution to culture and the arts. The Mount Cotton Guest House, a winner for Deluxe Accommodation last year, won for Excellence in Sustainable Tourism this year with Sue Panuccio and Trevor Penson recently launching their new eco cabins. Donna Shannon was successful for the second successive year, with Stradbroke Island Events winning the Specialist Tourism/Businesses Services category for its stylish and custom events services on North Stradbroke Island. Cr Williams said the hard work and innovation of all entrants was encouraging in the lead up to two significant international events in South East Queensland which will draw the focus of the world. “The Moreton Bay region gets to market itself internationally with world leaders here for the G20 summit next year and the Commonwealth Games on the Gold Coast in 2018,’’ Cr Williams said. Redland City Council tourism spokesman Cr Craig Ogilvie said the wins by the six local enterprises was a stunning result. “They show just how much Redlands’ tourism has to offer, matching the best when it comes to excellence in customer service and innovation,’’ Cr Ogilvie said. Brisbane City Council and Moreton Bay Regional Council, and are open to tourism operators in Redland City, Brisbane’s bayside suburbs and Moreton Bay Region.